These Maryland crab cakes have been in my family for generations. I’ve never had a better crab cake in my life, and I’ve tried countless versions! If you’re looking for an incredible crab cake recipe, look no further. I’ve lived in Maryland for my entire life and I can tell you this: we love our crabs. Steamed, soups, crab cakes… it’s what’s for dinner. When I have friends visit from out of town, they always want to go out for crabs and beer. It’s a tradition! My grandma, Zelda, has been making these jumbo lump crab cakes for as long as I can remember. I can tell you with complete certainty: these are the BEST crab cakes you’ll ever have. All jumbo lump meat, very little filler, no unnecessary ingredients. This recipe is legit. If you think you’ve had better, all I can say is this: don’t knock ’em till you’ve tried ’em. And be sure to check out all of those 5 Star ratings below. What type of crab meat is best for crab cakes? 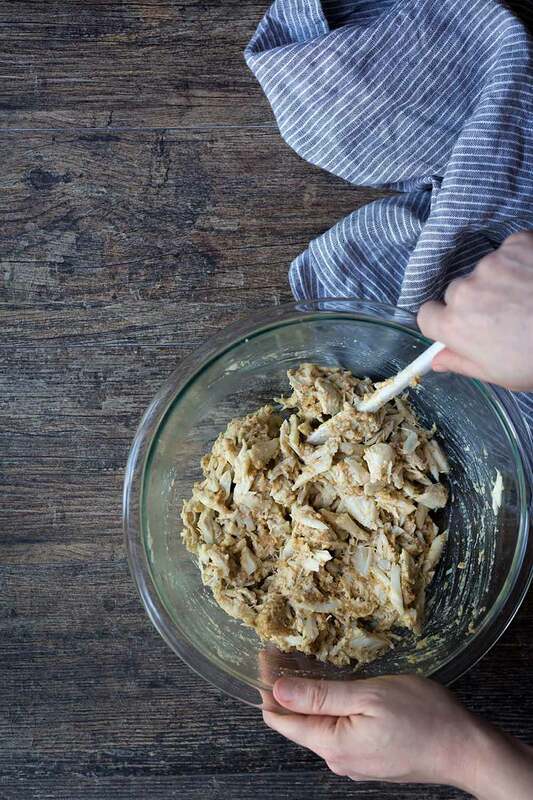 For BEST results, you need fresh, good quality jumbo lump blue crab meat for this recipe. I know that jumbo lump meat is ridiculously expensive, but there’s a reason for that. I’m not saying the flavors won’t still be good here with less expensive crab, but if you want the most authentic Maryland crab cake experience, you need to go for the best ingredients. I realize that many parts of the country/world will not have access to jumbo lump crab meat, so do the best you can. Ask around. Ask your local seafood restaurant for recommendations. Some people like to mix in backfin crab meat because it has a bit more flavor than the lump meat. You can do this if you like! It’s just not how my family does things. Give me all lump meat, all day long. If you can help it, I strongly recommend avoiding national chain brand crab meat. More likely than not, it’s not even blue crab meat; it’s probably from Asia. No flavor at all. Fines Herbs refers to a dried spice blend used commonly in French cuisine. It’s sold by many brands, but I’ve always used the one from Spice Island since it’s available at my grocery store. If you can’t find it at the store or online, you can make it at home. It’s made from a mix of commonly used herbs: parsley, chives, tarragon, and chervil. Google around and you’ll find plenty of recipes. Old Bay is a seasoning that’s considered a staple in many Maryland homes, including mine. It’s amazing on many seafood dishes, especially steamed crabs! I also use in things like dips and potato latkes. To me, a good crab cake MUST include Old Bay. We always broil our crab cakes. Fried crab cakes are tasty, but broiling truly allows the flavors and textures to shine through. Broil on the lower setting, and do not flip the crab cakes. The meat is already cooked; you are simply cooking the egg and solidifying the filling. These crab cakes are delicate because of that beautiful lump meat. Flipping them might cause them to fall apart. The low broil will give them a nice golden color, but you can adjust the setting to high for the final 30-60 seconds for an even deeper caramelization if you’re willing to watch them like a hawk. Baking will technically work, but you won’t get that crisp, caramelized top. 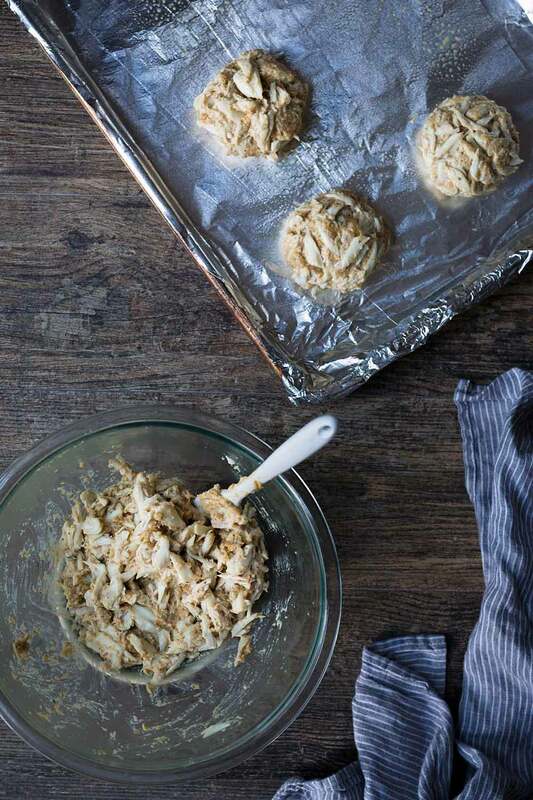 Broiling is truly the way to go when it comes to crab cakes. How do you store crab cakes? Store the crab cakes covered in the refrigerator for up to 3 days. If you’re not going to use them within a few days, these crab cakes freeze very well. Like everyone else in the family, I tend to make a double recipe and then freeze the leftovers (wrapping them individually). The crab cakes reheat in a couple of minutes and are a perfect meal. They make a great sandwich. What is a good crab cake sauce? I like crab cakes with dijon mustard (and Saltines). But many prefer tarter sauce. You can purchase jarred varieties at the store, but it’s easy to prepare at home. Check out this basic tarter sauce recipe from Ina Garten. Looking for More Crab Cake Recipes? 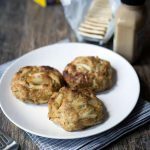 Check out my Jumbo Lump Crab Cake Sliders as well as my Jumbo Lump Crab Cake Bites! These crab cakes are my Grandma Zelda's recipe, and they have been in our family for generations. I've never had a better crab cake in my life, and I've tried dozens! Set the oven to low broil and place the oven rack near the top. 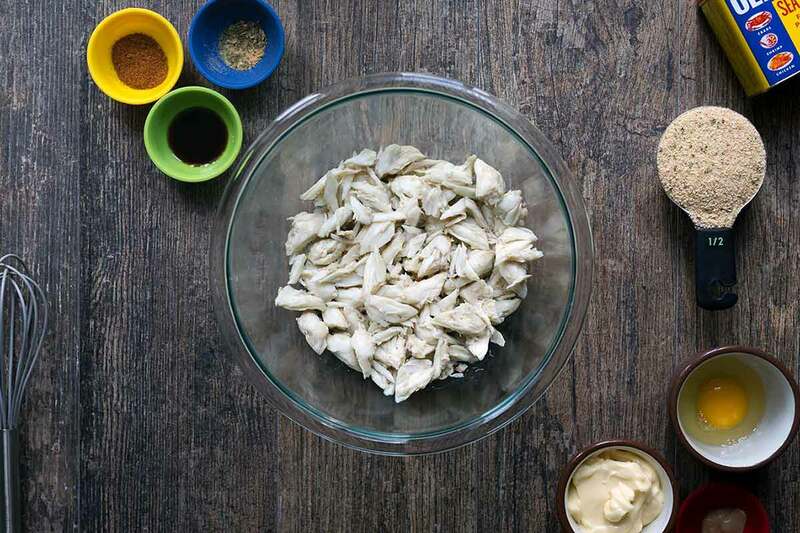 In a medium-sized bowl, carefully pick through the crab meat to remove any shells. Try not to break up the lumps. Be as thorough as possible. In a separate bowl, whisk the egg and then add in the mayonnaise until combined. Add the breadcrumbs and stir to combine. Add the Old Bay, fines herbs and garlic powder. Add the mustard and Worcestershire sauce, stir until well combined. Gently stir the wet mixture into the crab meat, one spoonful at a time. This part takes some patience because you really want to avoid breaking up the lump meat as much as possible. Carefully form 5-6 crab cakes. Lightly grease the bottom of a baking sheet (cooking spray works well for this) and place the crab cakes on the sheet. Place a small piece of butter on top of each crab cake. Broil on low for 12-15 minutes, keeping a close eye to make sure they don't burn. Don't flip them, just allow them to cook on one side the entire time (the lack of filler makes them very delicate). If the tops seem like they're going to burn, lower the oven rack. You're not cooking the meat but you want the filling to solidify and the egg to cook through. If you want the tops a bit more golden, switch the broiler to the high setting for the last minute or so. When the tops are golden brown, remove the pan from the oven and allow the crab cakes to cool slightly before serving. I recommend serving them with Saltine crackers and dijon mustard. They also make a great sandwich. I personally like to serve these with saltine crackers and some dijon mustard. That's it. There are recipes online for making Fines Herbs from scratch, but my grocery store sells the blend from Spice Island, which is what I've always used. I’ve made your crab cakes about 5 times now, and they’re a household staple. On a fixed income I don’t want to spend the $$$$ for the lump crabmeat. I wait for a sale on the cheaper stuff, and while it may not be perfect, it’s pretty darned tasty. Yesterday I made an excellent variation. I’m a diehard griller so I made smoked crab cakes. I got one side of the grill heating with applewood chips in my smoker box. When the grill got up to 350 I put the crab cakes in (on a wire mesh cake cooling rack) on the unheated side for indirect baking. Other baked crab cakes I’d seen recommend 30 minutes so that’s what I gave them. The smoky flavor was an excellent addition to the crab! It wasn’t a heavy smoke, just enough to give the cakes a hint of outdoor cooking. Delicious crab cake recipe! Broil vs fried is a personal preference here in Maryland, but most will broil over fry when dealing with blue crab meat. It usually takes a lot of filler to not fall apart in a fryer. To me, you want to taste the crab meat without the saturation of oil. 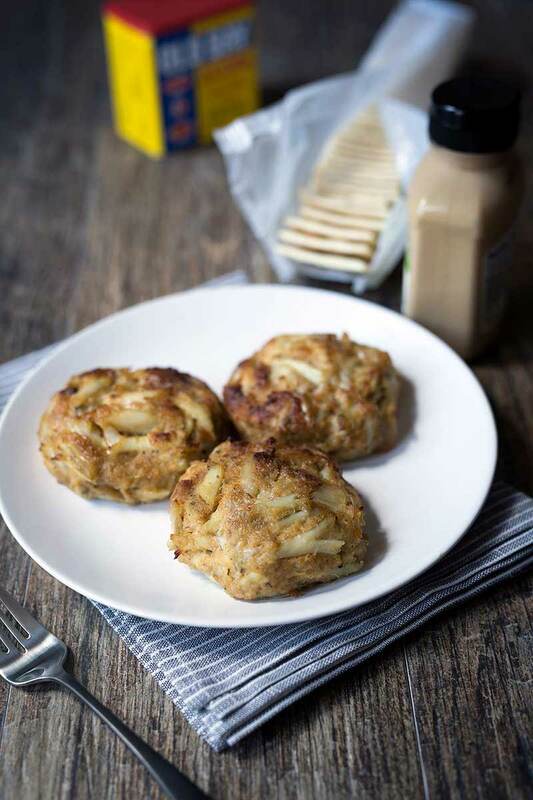 Usually cheap, frozen crab cakes are fried to dress up the fake or frost-bitten crab meat. Making them fresh is the way to go. Thank you for sharing. Jennifer, I too am a Maryland gal. I have lived in Alaska now for 20 years! It is almost Mother’s Day 2018. I asked my Sons to send me Jumbo Maryland Lump Crabmeat, due to arrive on Friday! Can’t wait to use your crab cake recipe and share some with our neighbors and freeze some, too! Thank you for your post. These crab cakes look amazing and I am planning to try them. I’m in Maryland too, and can’t find the fines herbes at any of my local stores (Spice Island’s website shows none within 20 miles of Rockville that carry it). Which grocery store chain in Maryland do you use that carries it? I made them over the weekend and they came out great. The trick is to use good quality lump crab meat. No canned or imitation crab! This is the real deal. Excellent crab cakes. Lots of butter and Old Bay!!! I made them for my first date, and she loved them. She wants to go out on another date, so I must have impressed her. I hope she likes me more than the crab cakes! ABSOLUTELY INCREDIBLE, JUST MADE THESE AND WIFE SAID THEY WERE VERY GOOD AND MOST OF THE TIME ALL I GET IS IT’S OK. Fantastic, and I am a crab cake LOVER. Best I have ever had, and I made them! Thank you! I am not a crab cake aficionado but I know good crab cakes when I taste them. These are EXCELLENT!! My husband who dislikes all things mayonnaise is addicted! These have become a special treat. The texture, taste and flavor are so true to what a crab cake should be in my opinion. Thank you! I make these all the time, they are so good! Thank you for sharing your recipe. Im a Marylander and was a little leary of using italian style breadcrumbs. I followed your recipe to a tee and they came out great. As an added bonus, they were picture perfect. Great recipe but may I suggest that the crab mixture be refrigerated for 3 hours before making into cakes? It truly brings the mixture together and lets the cakes stay more stable during broiling.